Give your windows an instant designer look without the designer cost. Available in a variety of gorgeous colors and made from silk, silk-like fabrics, and the finest quality linens available, these luxurious roman shades will bring elegance, style, and sophistication into your home. 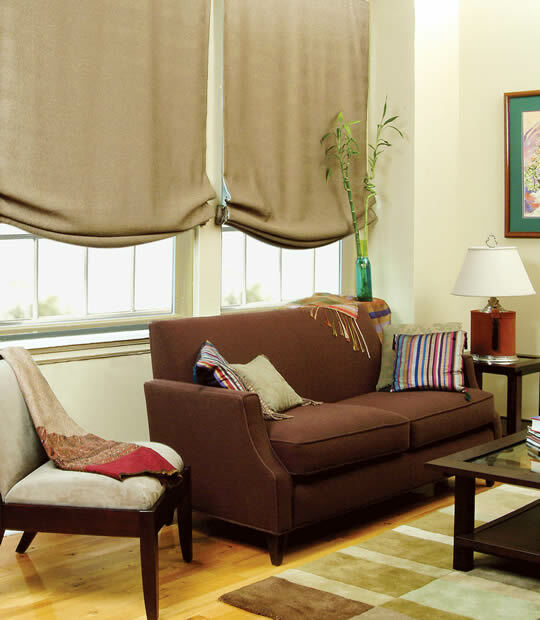 These shades are time tested for its elegance and style it brings to any home. The sides of the shade curve upward when the shade is raised. This softens the entire look of the shade as the fabric gathers in random soft folds. Small tack stitches used to attach the cord rings are visible on the face of the shade. When first installed this style should be pulled up fully and left in place several days to create "pleat memory". Be advised: This shade takes manual adjusting to achieve the desired effect. It is not recommended for frequent use, but more as a decorative shade. Pleat size is 4" formed as shade is raised. Top pleat size varies 4-1/2" to 14-1/2". One scoop under 60" W; two scoops over 60" W.
Continous cord loop shades ordered as outside mount are supplied with a 6" valance to concel control. Minimum length for continuous cord loop is 24"